30 years of service excellence in Phoenix & surrounding areas. Commercial & residential garage door repair & installation. 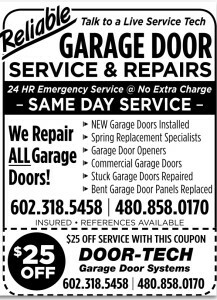 Emergency garage door repair – no extra charge! Garage door spring replacement, bent panels fixed and MANY more other home repairs. Please see website to read our customer satisfaction reviews! Handyman Services, A/C Maintenance & Repair, Drywall, Electrician, Painter, Plumber, Remodeling, Pool Service & Repair, Roofing, Irrigation Systems and Repair, Synthetic Grass. SE HABLA ESPANOL. Handyman, lamp repair, fan installation, landscape lighting, house watch. Area of service limited to Fountain Hills. Roofing, painting, carpet, tile, handyman services. All around general home repair service. Over 30 years experience, former builder, residential and commercial. No job too small!